Objective To assess the effectiveness of interventions to improve the microbial quality of drinking water for preventing diarrhoea. Data sources Cochrane Infectious Diseases Group's trials register, CENTRAL, Medline, Embase, LILACS; hand searching; and correspondence with experts and relevant organisations. Study selection Randomised and quasirandomised controlled trials of interventions to improve the microbial quality of drinking water for preventing diarrhoea in adults and in children in settings with endemic disease. Data extraction Allocation concealment, blinding, losses to follow-up, type of intervention, outcome measures, and measures of effect. Pooled effect estimates were calculated within the appropriate subgroups. Data synthesis 33 reports from 21 countries documenting 42 comparisons were included. Variations in design, setting, and type and point of intervention, and variations in defining, assessing, calculating, and reporting outcomes limited the comparability of study results and pooling of results by meta-analysis. In general, interventions to improve the microbial quality of drinking water are effective in preventing diarrhoea. Effectiveness was not conditioned on the presence of improved water supplies or sanitation in the study setting and was not enhanced by combining the intervention with instructions on basic hygiene, a water storage vessel, or improved sanitation or water supplies—other common environmental interventions intended to prevent diarrhoea. Conclusion Interventions to improve water quality are generally effective for preventing diarrhoea in all ages and in under 5s. Significant heterogeneity among the trials suggests that the level of effectiveness may depend on a variety of conditions that research to date cannot fully explain. We searched for all randomised and quasirandomised controlled trials of interventions to improve water quality for the prevention of diarrhoeal disease, regardless of language, publication status, or date of study. Participants were adults or children in settings with endemic diarrhoeal disease—that is, regularly present in the population. We excluded interventions in response to epidemic diarrhoea. Interventions included any measure to improve the microbial quality of drinking water. The primary outcome was diarrhoea related morbidity. We searched the specialised register of the Cochrane Infectious Diseases Group, CENTRAL, Medline, Embase, and LILACS to December 2005. We hand searched conference proceedings, contacted researchers and organisations working in the specialty, and checked the references of identified studies. Two reviewers independently examined the electronic records for potentially eligible studies and examined the full text of potentially eligible reports. Disagreements were resolved by a third reviewer. Two reviewers independently extracted data. Measures of effects reported were risk ratios, rate ratios, odds ratios, and longitudinal prevalence ratios (number of days or weeks with diarrhoea divided by number of days or weeks under observation in a person). As many of the trials were cluster randomised and had taken clustering into account in the data analysis (sometimes adjusting for covariates) we could not use the reported data to recalculate a common measure and yet preserve such adjustments. We therefore present the results separately according to the reported measures of effect. For randomised controlled trials we extracted data on the methods used to generate the allocation sequence, allocation concealment, blinding of outcome assessment, and inclusion or losses to follow-up on the basis of criteria developed by Juni.17 For quasirandomised controlled trials we assessed the comparability of intervention and control groups at baseline for water quality, diarrhoeal morbidity, age, socioeconomic status, access to water, hygiene practices, and sanitation facilities, and whether data collection for intervention and control groups was contemporaneous. We used a random effects inverse variance method on the log scale to calculate pooled estimates,18 and displayed the results graphically using RevMan 4.2. Heterogeneity was examined both visually by examining forest plots and statistically by using the χ2 test with a 10% level of statistical significance19 and the I2 test for consistency.20 Factors specified a priori in the study protocol as potential explanations for observed heterogeneity were age (all ages v under 5s), point of intervention (water source v household), type of intervention (water quality only v compound interventions: including hygiene messages, improved sanitation, improved supply), compliance (<50% v ≥50%), and effectiveness under various conditions for water supply, sanitation, and water access (using global assessment definitions from the joint World Health Organization and United Nations Children's Fund).3 We included all intervention arms in the meta-analysis even for trials in which two or more intervention arms were compared against one control, but identify this as a potential methodological flaw in the pooled estimates of effect. The combined search strategies identified 976 potentially relevant studies of interventions to improve water quality for preventing diarrhoea. The full text of 68 potentially eligible reports was obtained for further assessment after screening of titles and abstracts. 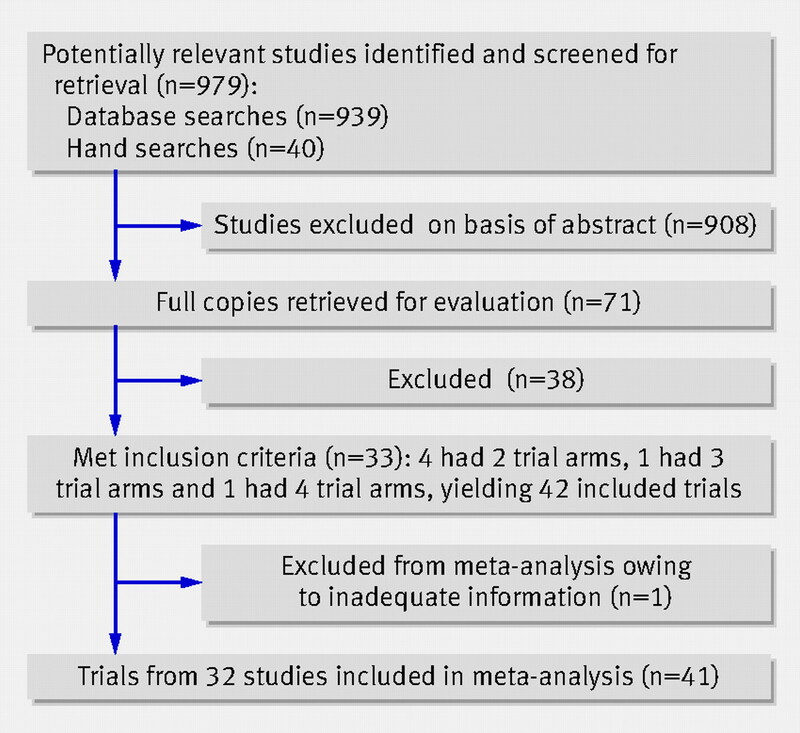 Of these 68 reports, 33 with 42 controlled comparisons met the inclusion criteria (fig 1⇓).w1-w33 The meta-analysis includes three new studies not in the original review.w6 w9 w29 Six studies included two or more intervention arms. The 33 studies (22 randomised controlled trials, 11 quasirandomised controlled trials) included about 55 650 participants (table 1⇓). Eighteen studies presented results for participants of all ages, 10 included only under 5s or a subgroup thereof, and the remainder reported on both age groups. In most trials the household was the unit of randomisation, although some randomised neighbourhoods, clusters of households, or villages. Trials of interventions at the water source (mainly the quasirandomised controlled trials) were generally longer (median 36 months, range 12 to 60 months) than those of household interventions (median 7 months, range 9.5 weeks to 12 months). All but two trials from the United Statesw8 w9 were carried out in developing countries. Two trials took place in urban settings, two in peri-urban settings, three in urban informal or squatter settlements, two in refugee camps, one in multiple settings, and the others in rural settings. The interventions to improve drinking water quality were undertaken at the level of either the water source (seven trials) or the household (35 trials). Water source interventions included protected wells, bore holes, or distribution to public tap stands; none included piped in (reticulated) household connections. Household interventions comprised improved water storage (one trial) or one of four approaches for treating water in the home: chlorination (16 trials), solar disinfection (three trials), filtration (eight trials), or combined flocculation and disinfection (seven trials). Apart from solar disinfection and flocculation-disinfection using a water purifying product (PUR sachet; Procter and Gamble), there were potentially important differences in the types of interventions. For example, filtration interventions varied by filter medium and pore size, and chlorination varied by chlorine source, dose, and contact time. Improvements in water quality were often accompanied by other environmental interventions intended to prevent faecal-oral transmission, including improved sanitation and water supplies, improved water storage in the home, and instruction on basic hygiene regarding contaminated water and diarrhoeal disease (table 1⇑). One study included the introduction of oral rehydration therapy.w24 However, 14 trials consisted solely of water quality interventions, although ceramic filters and solar disinfection interventions may also improve storage. Even when efforts were made to document compliance, investigators acknowledged that it was not possible to determine the extent to which participants in the intervention group consumed treated water or avoided consuming untreated water. Twenty one trials used the WHO definition of diarrhoea (three or more loose stools in the previous 24 hours); most others used local terms or mothers' definitions. All were based on self report. In most trials participants were visited on a periodic basis, either weekly (14 trials), fortnightly (five trials), or more infrequently (five trials), and were asked to recall episodes of diarrhoea during a previous period, usually seven days (18 trials) to 14 days (six trials). In some trials participants were asked to keep records of days with diarrhoea. Effect estimates included rate ratios (12 trials), risk ratios (eight trials), longitudinal prevalence ratios (11 trials), and odds ratios (10 trials; table 2⇓). One trial did not provide enough information to calculate the actual measure of effect and was excluded from the meta-analysis.w31 Most studies adjusted for covariates. However, none of the source based interventions and four of the household based trialsw2 w19 w23 w32 did not report adjusting for clustering and may thus receive excess weight in meta-analysis due to artificial precision. Figure 2⇓ present the forest plots for studies reporting effect estimates for all ages and for under 5s. Most trials recorded notable reductions in diarrhoea; none found the interventions to be associated with a statistically significant increase in diarrhoea related morbidity. The evidence from the pooled estimates of effect for all trials by each measure of effect suggests that interventions to improve the microbial quality of drinking water are effective in reducing the occurrence of diarrhoea both for all participants and for under 5s (table 2⇑). Pooled estimates were, however, characterised by considerable heterogeneity (table 2⇑). A subgroup analysis was carried out on the criteria specified in the protocol to attempt to explain such heterogeneity. Table 2⇑ shows the pooled estimates of interventions at the water source level and at the household level. Although individual trials of source based interventions reported the intervention to be effective, the pooled estimate for trials using rate ratios fell short of statistical significance, both among four trials reporting data for all ages (0.87, 95% confidence interval 0.74 to 1.02) and three trials reporting on under 5s (0.93, 0.82 to 1.05). The two studies on source based interventions reporting the highest level of effectiveness could not be pooled because they used different measures of effect.w24 w33 Moreover, the small number of clusters and the failure to take clustering into account in the analysis must raise doubts about the validity of such estimates. Household interventions, on the other hand, significantly reduced diarrhoea episodes among people of all ages and among under 5s, as measured with rate ratios, risk ratios, and odds ratios, but these pooled estimates were still heterogeneous. The pooled longitudinal prevalence ratio for household interventions was statistically significant when a possible outlierw13 was excluded from the analysis for all age groups (0.70, 0.56 to 0.88; nine trials) and for under 5s (0.76, 0.66 to 0.88; nine trials). Among trials reporting odds ratios, the pooled estimate of effect was substantially higher in settings where compliance with the intervention was higher (≥50% compliance (four trials), odds ratio 0.39, 95% confidence interval 0.39 to 0.51 v <50% compliance (four trials), 0.80, 0.71 to 0.89). These results must be interpreted with caution as the four trials comprising the less than 50% category are from one studyw27 and are compared with only one control group. Subgroup analyses for each measure of effect were carried out according to whether the water supply or sanitation was “improved” or “unimproved” on the basis of established criteria. No statistically significant differences were found between pooled estimates on the basis of these criteria. However, pooled estimates show a statistically significant effect in favour of intervention even in settings without improved water supply (seven trials reporting rate ratios, 0.74, 95% confidence interval 0.63 to 0.87; four trials reporting risk ratios, 0.46, 0.36 to 0.58; six trials reporting longitudinal prevalence ratios, 0.83, 0.68 to 1.01; and nine trials reporting odds ratios, 0.66, 0.57 to 0.77). Interventions were also effective in settings without improved sanitation (four trials reporting rate ratios, 0.78, 0.64 to 0.95; two trials reporting risk ratios, 0.55, 0.47 to 0.65). Pooled estimates showed that water quality interventions were significantly effective when introduced alone or in combination with other environmental interventions (hygiene instruction, improved water storage vessel, improved sanitation, or improved water supply). Notably, however, no evidence was found for water quality interventions being more effective when combined with other components than when implemented alone. Pooled estimates for water quality interventions alone (seven trials reporting odds ratios, 0.61, 95% confidence interval 0.50 to 0.73; five trials reporting rate ratios, 0.76, 0.52 to 1.02) were not statistically different from pooled estimates for trials combining water quality with instruction on basic hygiene (one trial reporting odds ratio, 0.52, 0.30 to 0.90; three trials reporting rate ratios, 0.85, 0.70 to 1.03), water quality with a storage vessel (three trials reporting odds ratios, 0.77, 0.58 to 0.84; four trials reporting rate ratios, 0.61, 0.46 to 0.81), water quality plus sanitation (three trials reporting odds ratios, 0.60, 0.43 to 0.84; one trial reporting rate ratio, 0.75, 0.70 to 0.80), or water quality with improved water supply (four trials reporting odds ratios, 0.70, 0.59 to 0.84; two trials reporting rate ratios, 0.77, 0.71 to 0.84). Subgrouping trials on study design (randomised and quasirandomised controlled trials) did not show a trend in favour of either design approach (table 3⇓). Greater protective effects were generally reported among randomised controlled trials with high quality for sequence generation, allocation concealment, and inclusion or losses to follow-up. 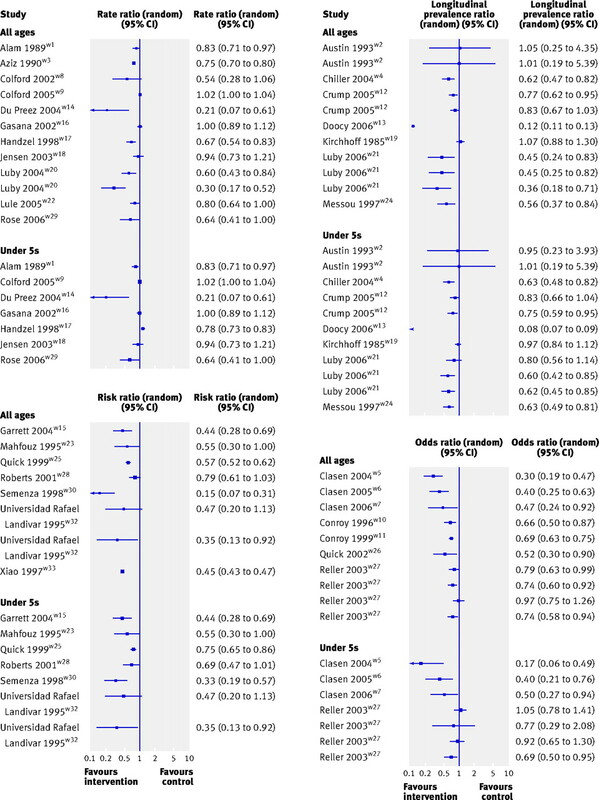 Only four studies, however, used double blinding (table 1⇑) and none of these found a statistically significant protective effect from the water quality intervention. Similarly, among quasirandomised controlled trials, effects in studies meeting the specified criteria for methodological quality were larger. Few trials, however, failed to meet these criteria, and subgroup analyses did not explain the heterogeneity. This systematic review of 42 controlled trials among some 56 000 participants shows that interventions to improve the microbial quality of drinking water are effective in reducing the occurrence of diarrhoea in adults and children. Although substantial heterogeneity was found in the magnitude of the effects, the evidence for the effectiveness of water quality interventions was compelling. Pooled estimates from 12 studies reporting rate ratios suggest that household based interventions are more effective at preventing diarrhoea than water source based interventions. Such estimates, however, exclude the results from the two studies of source based interventions that reported the highest level of effectiveness and that achieved results equivalent to the household based interventions using the same measure of effect.w24 w33 Evidence was also found for effectiveness being related to compliance with the intervention. Water quality interventions were effective in reducing diarrhoea even in the absence of improved water supplies and sanitation. Effectiveness did not seem to be enhanced by combining the intervention with other common strategies for preventing diarrhoea (instruction on basic hygiene, improved water storage, or improved water supplies and sanitation facilities). Although the evidence does not rule out additional benefit from combined interventions, it does raise questions about whether the additional cost of such integrated approaches as currently implemented is warranted on the basis of health gains alone. The validity of the results of this systematic review depends on the validity of the included studies. Many of the trials were only quasirandomised and failed to take all the steps necessary to avoid bias. In subgroup analyses, however, trials that were of higher methodological quality for allocation concealment showed a greater overall level of effectiveness. Only four of the 22 randomised controlled studies, however, were properly blinded, and in each no statistically significant protective effect was found.w2 w8 w9 w19 Two of the non-blinded trials were carried out in a developed country where drinking water already complied with US standards,w8 w9 one trial included only 112 people (the smallest of all the included trials) and was rated low on three other criteria for methodological quality,w19 and one used dilute sodium hypochlorite in the control group, which may have improved water quality leading to an underestimate of the effectiveness of the study intervention.w2 Thus other reasons apart from methodological concerns may exist for why these trials failed to show effectiveness. Nevertheless, in the light of the results from the non-blinded trials, some caution must be exercised in interpreting the strength of the evidence to date. The design of the trials was not independent of the type of intervention. All seven trials concerning interventions at the water source were quasirandomised, whereas 31 of the 35 studies of point of use interventions were randomised. Although this reflects the difficulty of randomising users of water source interventions, our inferences about the relative effectiveness of these two approaches may be biased by the study design. Subgrouping on study design and methodological quality did not suggest an association between effectiveness and method of randomisation. If the general observation that trials with weaker designs show more promising intervention effects applied to this population of studies, then the relative effectiveness of household and water source interventions may have been biased against household interventions. Moreover, the context and length of follow-up in the trials was not independent of the intervention. Trials of household based interventions tended to be research driven investigations, whereas those of source based interventions were often evaluations of actual programmes. The duration of trials of source based interventions was nearly six times that of interventions at the household level. Four of the six trials on source based interventions lasted three or more years, whereas only four of the 35 household interventions lasted one year. Seasonality is important in assessing diarrhoea, and the failure to include data on diarrhoea for at least 12 months may have influenced the estimates of intervention of effect.21 Nevertheless, visual inspection of a scatter plot of trial duration against effectiveness showed no association. The most cited reviews of the effectiveness of interventions to prevent diarrhoea are by Esrey et al.8 9 These reviews, however, used a limited search strategy that omitted many studies, combined observational studies and trials, had limited assessments of methodological quality, and reported intervention effects as median reductions. The reviews included only studies investigating improvements of water quality at the source and did not include interventions at the household level.8 9 The 15% to 17% median reduction in occurrence of diarrhoea reported for source interventions is consistent with our results for source based interventions. Fewtrell et al14 reported significantly higher effectiveness from interventions at the household level (pooled estimates across different measures of effect of 35% from 12 household based interventions compared with a statistically insignificant 11% from three source based interventions), but did not include several unpublished studies and included interventions against epidemic diarrhoea in their analysis, which could skew results. Interventions to improve the microbial quality of water are effective in reducing the occurrence of endemic diarrhoea. Some evidence was found that household based interventions are capable of significantly higher levels of effectiveness, roughly comparable to certain other environmental interventions to prevent diarrhoea, such as improved sanitation, hygiene (hand washing with soap), and improved water supply.14 23 Moreover, contrary to previous conclusions,24 25 water quality interventions are effective even in the absence of improved sanitation and water supply and they do not always require concomitant hygiene promotion for their effectiveness. These results support the WHO strategy of promoting the treatment and safe storage of household water as a means of accelerating the health gains of safe drinking water, even though it may not reduce the numbers of people (1.1 billion) currently without access to improved water supplies. Rigorous, multiarm randomised controlled trials in different settings that compare various approaches to improving drinking water quality will help clarify the potential for water quality interventions to prevent endemic diarrhoea. It is particularly important that such trials be blinded, if possible, not only for the methodological reasons that favour blinded trials generally but also because of the ineffectiveness reported in blinded studies of water quality interventions to date. A need also exists for longer term studies in programmatic (non-research driven) settings, especially on household based interventions. Differences in programmatic approaches to optimise the adoption and long term utilisation of these interventions should also be investigated. Finally, as most of the burden from diarrhoeal disease is associated with mortality rather than with morbidity, future research should include studies specifically designed to determine the effectiveness of interventions to improve water quality in preventing death, particularly among vulnerable populations such as the under 5s and people living with HIV/AIDS. Household interventions require effort on the part of householders to treat their water correctly, to have treated water consistently available, to avoid recontamination, and to refrain from drinking from untreated sources. Each of these conditions creates an opportunity for non-compliance, which we found to reduce effectiveness. Most source based interventions, however, extended to the household's entire water supply without any additional steps for compliance on the part of the intervention population. It is therefore important to assess whether the target population will use these household interventions correctly and consistently over the long term. Ultimately the value of water quality interventions in preventing diarrhoeal disease depends not only on their effectiveness but also on their affordability, acceptability, sustainability, and scalability within a vulnerable population—issues that the studies included in this review mainly did not address. Comprehensive cost effectiveness and cost benefit analyses will also help establish the priority that should be attached to water quality interventions by the public sector, donors, and non-governmental organisations. We thank Greg Allgood, Jamie Bartram, Julia Bohlius, Joseph Brown, Jack Colford, John Crump, Tom Chiller, Val Curtis, Shannon Doocy, Lorna Fewtrell, Carrol Gamble, Bruce Gordon, Stephen Gundry, Bruce Keswick, Steve Luby, Rob Quick, Mark Sobsey, Sara Thomas, and James Wright for their research, advice, assistance, and other valuable contributions; members of the Cochrane Infectious Diseases Review Group; and the referees of the Cochrane review and its protocol. Contributors: SC conceived the review. TC coordinated the review, drafted the protocol and review, carried out the search strategy, retrieved the papers, contacted authors, and prepared the tables and figures. TC is guarantor. TC, IR, TR, and W-PS designed the review. TC and TR screened the search results. TC, TR, and SC applied the inclusion criteria. TC, TR, and W-PS extracted the data, calculated estimates of effect, and dealt with the statistics. TC, TR, and IR applied the quality criteria. TC and W-PS entered data into RevMan. IR, TR, W-PS, and SC commented on the review. Competing interests: TC, W-PS, and SC participate in research supported by Unilever and Vestergaard-Frandsen, which manufacture and sell household or other point of use water treatment devices. World Health Organization. The world health report: 2005: make every mother and child count. Geneva: WHO, 2005. World Health Organization and United Nations Children's Fund. Global water supply and sanitation assessment. Geneva: WHO/UNICEF, 2000. Cairncross S. Water supply and sanitation: an agenda for research. J Trop Med Hyg 1989;92:301-14. Esrey SA, Habicht J-P. Epidemiologic evidence for health benefits from improved water and sanitation in developing countries. Epidemiol Rev 1986;8:117-28. Lindskog U, Lindskog P, Wall S. Water supply, sanitation and health education programmes in developing countries: problems of evaluation. Scand J Soc Med 1987;15:123-30. Briscoe J. Intervention studies and the definition of dominant transmission routes. Am J Epidemiol 1984;120(3):449-55. Roy S, Scallan E, Beach MJ. The rate of acute gastrointestinal illness in developed countries. J Wat Health 2006;4(Suppl 2):31-70. Colford JM, Roy S, Beach MJ, Hightower A, Shaw SE, Wade TJ. A review of household drinking water intervention trials and an approach to the estimation of endemic waterborne gastroenteritis in the United States. J Wat Health 2006;4(Suppl 2):71-88. Esrey SA, Feachem RG, Hughes JM. Interventions for the control of diarrhoeal diseases among young children: improving water supplies and excreta disposal facilities. Bull WHO 1985;64:776-2. Esrey SA, Potash JB, Roberts L, Shiff C. Effects of improved water supply and sanitation on ascariasis, diarrhoea, dracunculiasis, hookworm infection, schistosomiasis, and trachoma. Bull WHO 1991;69:609-21. Clasen T, Cairncross S. Household water management: refining the dominant paradigm. Trop Med Int Health 2004;9:1-5. Fewtrell L, Kaufmann R, Kay D, Enanoria W, Haller L, Colford J. Water, sanitation, and hygiene interventions to reduce diarrhoea in less developed countries: a systematic review and meta-analysis. Lancet Infect Dis 2005;5:42-52. Wright J, Gundry S, Conroy R. Household drinking water in developing countries: a systematic review of microbiological contamination between source and point-of-use. Trop Med Int Health 2003;9:106-17. Clasen T, Roberts I, Rabie T, Schmidt W, Cairncross S. Interventions to improve water quality for preventing diarrhoea. Cochrane Database Syst Rev 2006;(3):CD004794. Juni P, Altman DG, Egger M. Systematic reviews in health care: assessing the quality of controlled trials. BMJ 2001;323:42-6. Egger M, Smith GD, Altman DG, eds. Systematic reviews in health care: meta-analysis in context. London: BMJ Books, 2001. Higgins JPT, Thompson SG, Deeks JJ, Altman DG. Measuring inconsistency in meta-analysis. BMJ 2003;327:557-60. Blum D, Feachem RG. Measuring the impact of water supply and sanitation investments on diarrhoeal diseases: problems in methodology. Int J Epidemiol 1983;12(3):357-65. Cairncross S, Valdmanis V. Water supply, sanitation, and hygiene promotion. In: Jamison DT, Breman JG, Measham AR, Alleyne G, Claeson M, Evans DB, et al, eds. Disease control priorities in developing countries. 2nd ed. New York: Oxford University Press, 2006. Curtis V, Cairncross S. Effect of washing hands with soap on diarrhoea risk in the community: a systematic review. Lancet Infect Dis 2003;3:275-81. Briscoe J, Feachem RG, Rahaman MM. Evaluating health impact: water supply, sanitation, and hygiene education. Ottawa: International Development Research Centre, 1986. Van Derslice J, Briscoe J. Environmental interventions in developing countries: interactions and their implications. Am J Epidemiol 1995;41:135-44.